Long ago, an event known as the Byobu Matsuri ("Folding Screen Festival") was held each year in conjunction with Kyoto's famed Gion Matsuri, during which the wealthier residents of Kyoto would open their homes to the public to show off their valuable art collections. 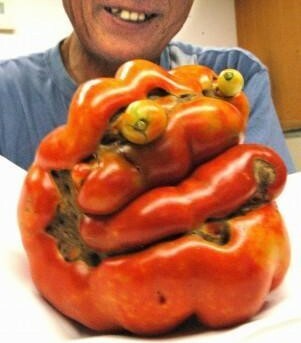 Today, in what is being billed as a modern-day re-enactment of that custom, nine Kyoto-area establishments are displaying works of art as part of the Nihonga Byobu Matsuri Exhibit. Among the participating hosts of the exhibit are two Kentucky Fried Chicken restaurants in Kyoto's Chukyo district, which are displaying folding screens and hanging scrolls by painter Taro Yamamoto, known for incorporating Western fast food iconography into nihonga (Japanese-style painting). 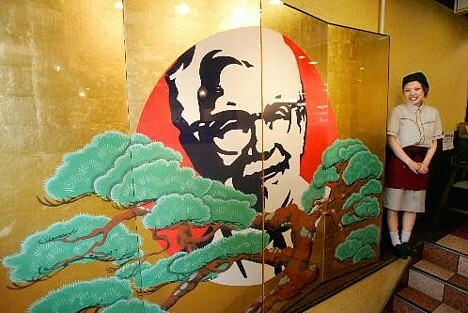 KFC's Shijo-gawara restaurant is displaying two of Yamamoto's works, including a gilded folding screen depicting the face of Colonel Sanders and the Japanese flag floating above a classic pine tree (pictured above). 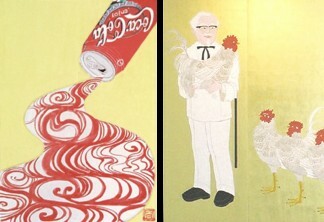 KFC's Shinkyogoku branch is displaying three of Yamamoto's works, including a gilded folding screen depicting Colonel Sanders holding an Ito Jakuchu-style chicken and a hanging scroll featuring a can of Coca-Cola. The Nihonga Byobu Matsuri Exhibit is being held from July 7 to 17.